But then..whatever begins has to end ..and when it ends it better be on a sweet note...For the last day of buffet on the table, I bring the topic close to my heart..artistic culinary. De-constructing desserts is not usual for Indian sweets and dessert recipes. It is more popular with continental cuisines. While there is no dearth of indian recipes that can be combined to make one beautiful plate but I have not come across much of it. Photography is not my passion as yet and thus I tend to get flustered when it comes to clicking many pictures..I tried to put some effort for this post just to ensure that I am able to get across the point for this article but if you are able to pardon me with that, I would urge you to consider the concept over the appearance. I think it is time to move on from cupcakes & decorating cakes...so I made the below 3 desserts for DH's birthday. It was way too much but he enjoyed a small bite of each and gave very great reviews for all of them. C) The right combinations comes with good texture mix up - soft and very soft wont go great, but soft and dry with liquid works well...add in some crunch in whatever form. E) Lastly, balance sweetness - make one element sweet and other just about to avoid sugar overdose. This one was super tasty, I used store bought ras malai rosgollas (we get big large one and slightly flattened ros gullas) for the rasmalai recipe. They are not soaked i excessive syrup and can be used to cut and fill easily. I normally use them to make simple malai sandwich at times..
For the malai filling, mix heavy cream with smooth blended khoya and sugar until you get a smooth mixture. I made two batches one in white and one with a dash of edible pink color. The use of praline helped to keep the crunch of the dish and give a slightly bitter caramel kind of flavor to counter the lactose and sugar coming from both gulab jamin and rabdi. For Praline, I just melted plain castor sugar mixed with a tspn of honey in a non stick on medium flame, when it became golden, added the chopped nuts and swirled the pan. When it became deep amber colored as seen in the picture..pour the mixture on a greased plate. Then broke the pieces and used it. The pistachios were lending a nice flavor when they suddenly popped within the gulab jamuns. My friut shrikhand gave up to the sudden summer onslought but I could have put it in a small katori which I will do next time. For plating, I used piping bag to create a pattern and on the side sprinkled crumbled motichoor laddoo. On the side, I used plain shrikhand with a drop of chilly, ginger and tulsi extract. The quantities made it go unnoticed, I though, but I got great feedback on the taste. I was originally planning to color each drop in a different color - ginger - light orange, chilly bright red and tulsi - green, but that would have given away the novelty I felt. But next time, I will make it that way. I just topped it with pistachios as it looked plain. I may add more to this list ...some day.....winding up..
Beautiful post but truly pics dont do justice.. I loved reading and wnjoyed this post the most . Shows so much effort going in there . Pradnya, that's one awesome past yaar..fantastic..I am not into sweets, deconstructing or otherwise!..so this was enlightening!..I admire the thought process in getting this post across, gives so many ideas for us right..Dessert has always been straight up gulab jamun with ice cream or just the regular ones..this surely takes it to the next level!..I enjoyed all your posts..fantastic work on them! Very interesting post Pradanya.Lots of innovation and efforts are going in.This is a wonderful idea .I like your hand carving on the apple too.Good job! Okay this one is something that I have to first accept. Because hubby does this all the time. And you know they are never right. Will copy and print your post to get to the root of the post. As for your pics they are way more awesome. I guess you will do better by leaps and bounds. Hey this is a fantastic post, Pradnya. Enjoyed all your posts this marathon. Wow, you have beautifully presented traditional Indian sweets. These look very fancy. Thanks for sharing your thinking process in deconstructing these sweets. Wow this looks like a Chef's dessert platter, looks awesome Pradnya, lovely plating as well..I have to think about making deconstructing our popular Indian sweets now. What a great way to present these sweets? Love the idea of deconstructing it. kOMG Pradnya, this is just amazing. 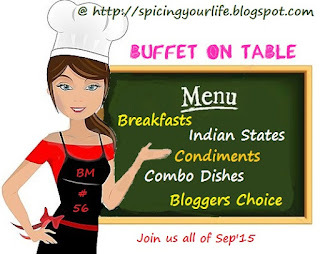 What an awesome post -- love your 'gourmet' take on the Indian desserts. So chic and elegant. Bookmarked to try some time soon.